I have been a lover of horses my entire life. 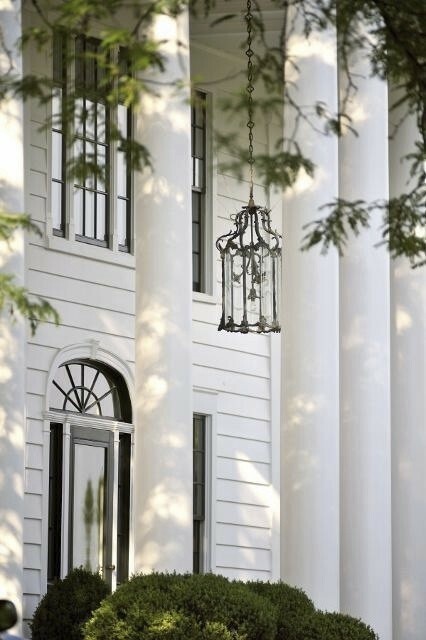 The other day I was enjoying reading one of my favorite blogs, The Enchanted Home, where she featured a beautiful home that was referred to as The Polo House, that was equestrian inspired. Reading the post, and seeing the photos hit me with a flow of nostalgia. I had the privilege over the years of fulfilling my own dream of building a small horse farm, raising some foals and showing, mostly National Show Horses. I have had horses my entire adult life. I miss being around them on a daily basis. I had a few that were my heart horses and not a day goes by that I do not think of them. 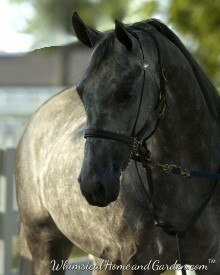 I still get my horse magazines and newsletters, and The Vinery was listed “For Sale” in a Dressage Daily Newsletter. I have a particular fondness for this farm. One reason was I visited it twice on tours, and another because they stood at stud a couple of horses that I was particularly fond of. 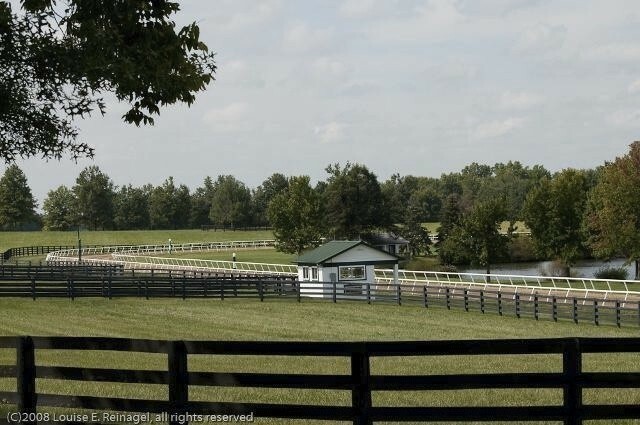 I used to travel to Chicago on business from NC and on those times I drove, I always left a day early so I could overnight in Kentucky and try an get enough of a horse dose that I was able to get through tedious business meetings. 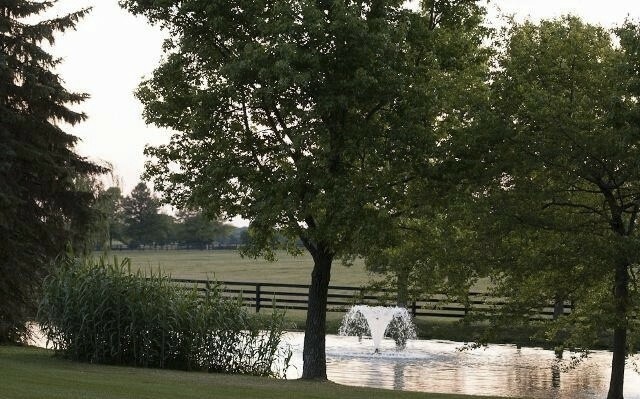 Vinery Farms near Lexington is a premier Thoroughbred breeding establishment. 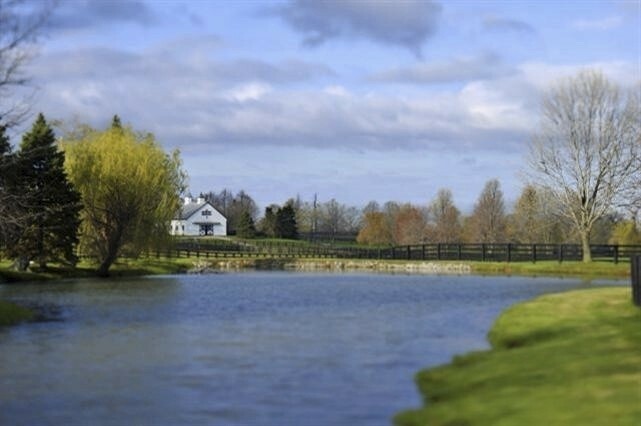 This farm is part of a breeding and training operation owned by German Tom Simon. He plans on continuing his overseas Australian operations but wants to sell this, another farm in Florida, and the leased operations in NY as a package to someone as dedicated as he is, willing to keep it together. He is selling because “his children do not have an interest in the horse business….it is my passion not theirs”. Why couldn’t I have been his daughter????? The Lexington operation is 440 acres, and the one in Florida is 230 acres, with more than a mile of road frontage on the Lexington farm. 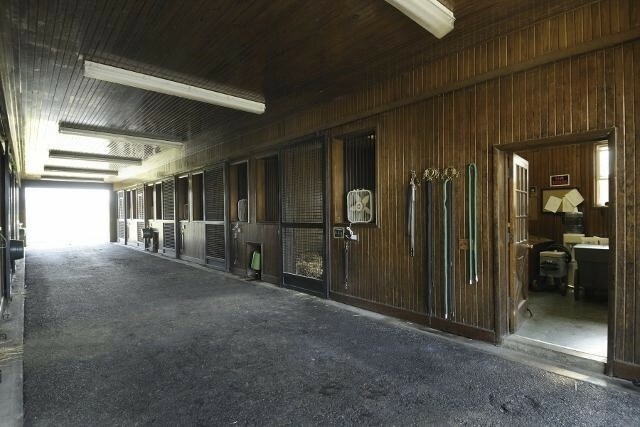 The Lexington property has many outbuildings, including 11 barns. Smaller managers houses dot the property as well. It is a beautiful property. 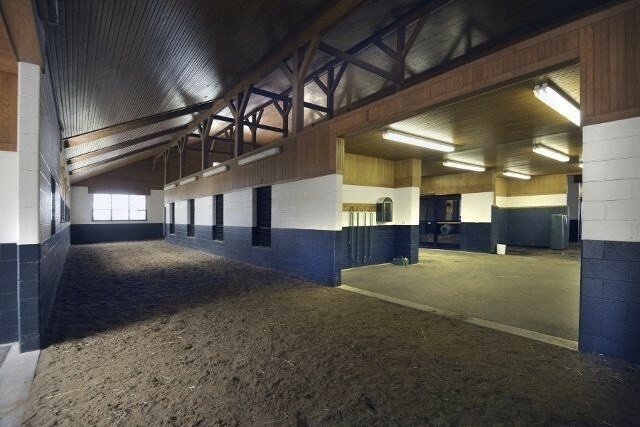 It makes me very sad to see these barns empty of horses and life, as well as the jobs that will vanish without a buyer. I was unable to find interior house photos, sorry. 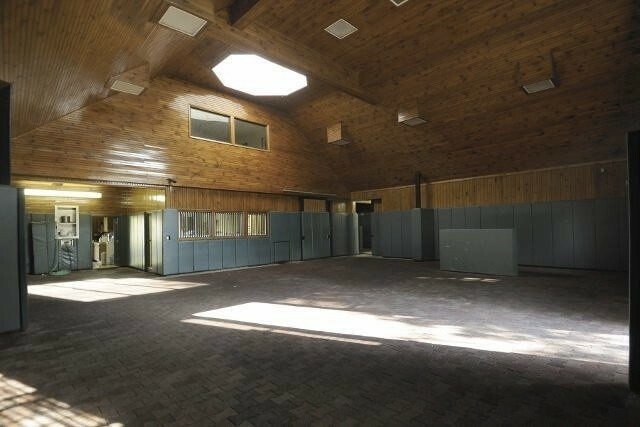 The main house consists of 5245 sq. 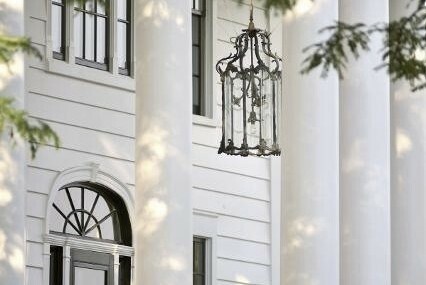 ft., and was extensively remodeled, so I would have enjoyed seeing photos. Farms are sadly part of a vanishing American landscape,and horse or otherwise, I felt it worth sharing despite no interior house shots. 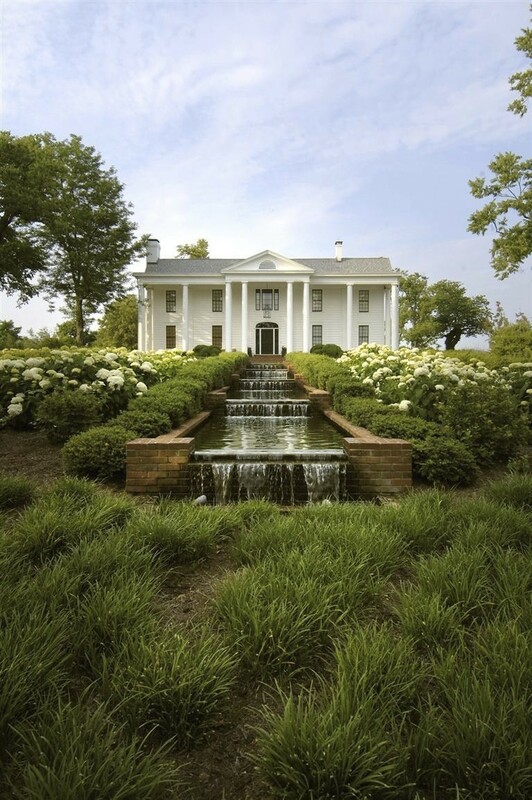 Oh yes, it all can be yours for $13,970,000……. Front view of the house. Love the waterfall. How lovely it must be to pull up to the front door and hear the water. And what would a horse farm be without the horses? 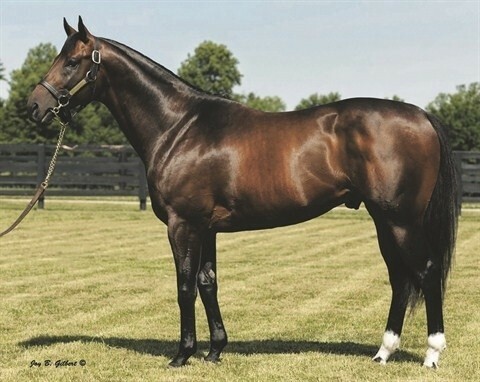 Here are two stallions that stand at stud for Vinery Farms. 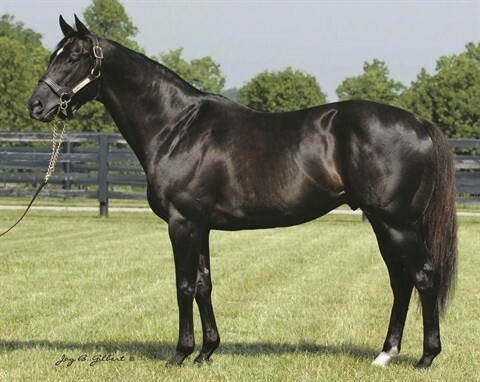 pastures and at shows where he had many fans and competitors cheering for him. Is this the same farm that use to have Lost Code, located about a mile from Midway College. 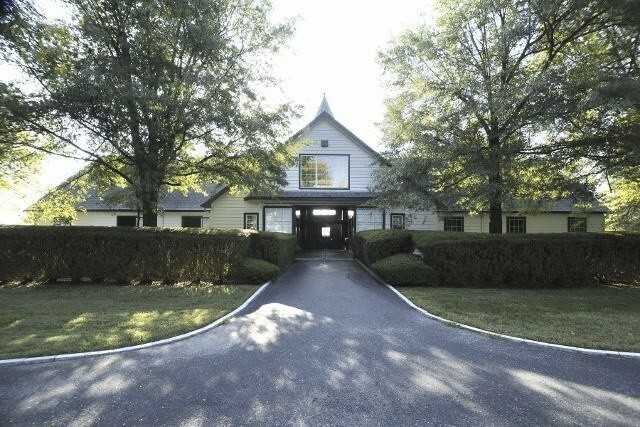 I was fortunate enough to visit this beautiful horse farm early in its beginning and seeing one of the greatest race horses that I’ve ever seen run on the track. In 1987 Lost Code won 5 derby that year and ran against Alysheba and Bet Twice in that years Haskell Invitational which still is one of the greatest finishes in it history of that race. I was just wandering if he was still there at the farm if he’s still alive he would be 33 this year. Thank you for the reminisce. Heard about your blog from Tina at The Enchanted Home. Loved your post! 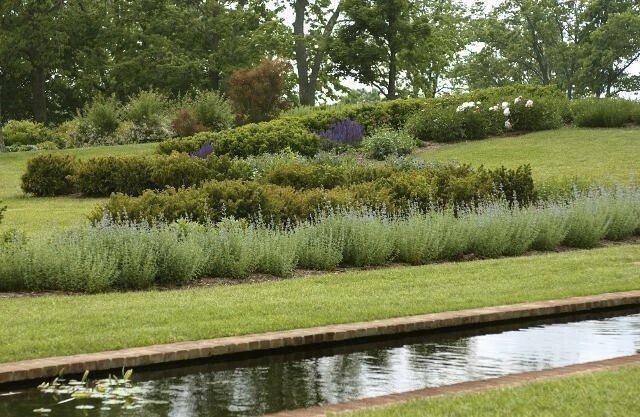 I live just south of Lexington, KY and did not know about this beautiful property. Thank you for sharing the lovely photos. 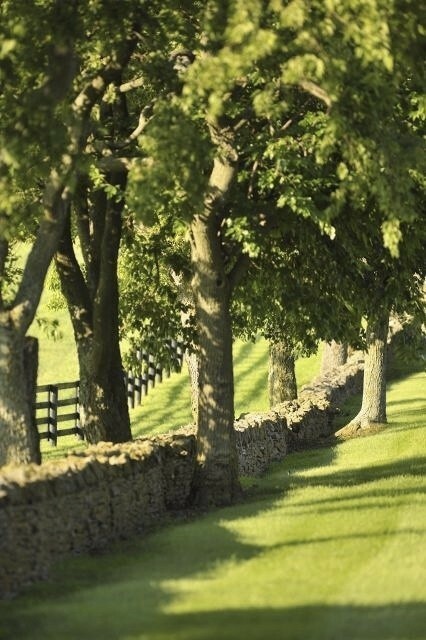 I love my Bluegrass State and am proud to be a Kentucky girl. I look forward to following your blog. Coming over from Tina’s 🙂 Another horse and equestrian lover .. I’ll look forward to following along! Such gorgeous property and the most statuesque horses I’ve ever seen. Thank you for stopping by! 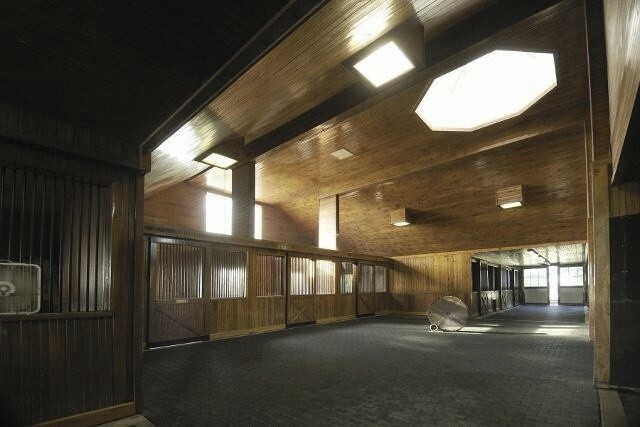 I will continue to showcase horse farms as I come across them. Horses will always be in my blood, and I look forward to sharing them with folks. I visited your blog as well, and your photographs are beautiful, and I look forward to following you as well. Your Springers are lovely, and are one of my favorite breeds. 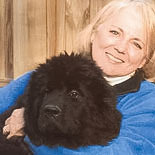 I handled a few over the years at dog shows for friends as well, and they are so much fun to show! So looking forward to getting to know the folks that have stopped by. Welcome to the lovely world of blogging Charisse! (Love your name by the way-so pretty). Discovered you via Tina (TEH). Looking forward to getting to know you better. You are off to a great start! Fantastic post, such gorgeous photos. The photos took my breath away. So beautiful and so tranquil. I could see myself spending the rest of my golden years in such a beautiful setting with my beloved newbies by my side. Hi Charisse! Oh my gosh..I have died and gone to horse farm heaven. This is downright heavenly. 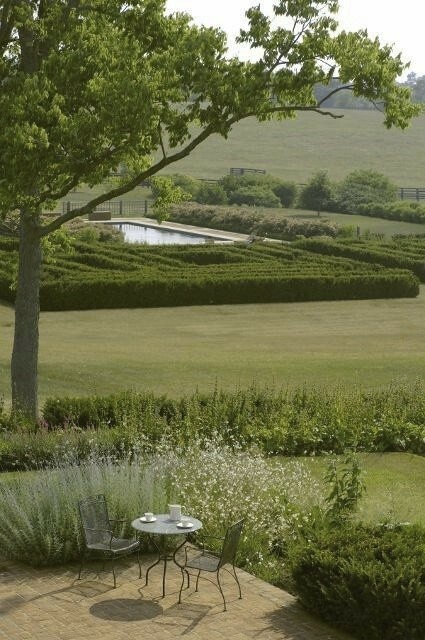 I want to sell everything and move to Kentucky. I could garden, decorate, cook, ride horses to my hearts content. What an absolutely fabulous place. So nice to meet you, thanks for your kind intro and sweet email. I am going to be following you now…..and look forward to seeing what you have to say, welcome to blogland!